CoLab Radio » Blog Archive » Jargon Mondays: What does "urbanism" mean? Jargon words are words that seem to mean everything and nothing all at once. City Planners use jargon every day. Think of phrases like “urban fabric” and “the community” and “hyper-local”. Each blog post in this series will include a short, fictional story about one jargon word, but without ever using the word. If you listen to the story, you might think of a different way to talk about a phrase you find yourself using every day. 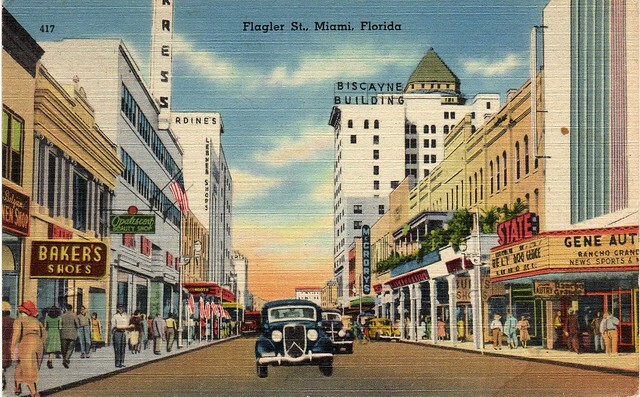 A 1938 postcard of downtown Miami, Florida. By tablewareforsale on Flickr. Story by Lawrence Barriner and Ruth Sappelt. If you have a fictional story to describe a jargon word, call it in to our vojo page. Thanks for tackling this. I’ve been wondering for sometime. So is Urbanism like a string of serendipitous events that are actually pre-programmed by an invisible hand in order to make me believe “Wow, it really is all about me!” ? Is this what you meant to evoke? Or am I missing some crucial things?